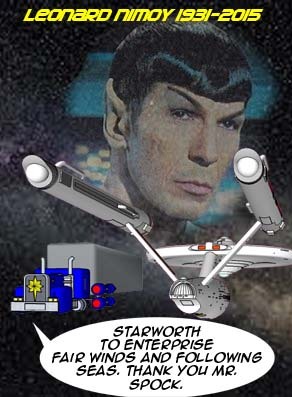 Anyone who reads Magical Misfits and does not realize that I am heavily influenced by Star Trek is not paying attention. Star Trek came along during the western era the only Science fiction was old Flash Gordon serials and Lost in Space. Star Trek was just amazing. Look Ahead to a bright future. People living together Black White Female and yes Alien non human. It was radical ahead of everything. Leonard Nimoy showed cool under fire. If Kirk had died the ship was in good hands. Thank You Leonard Nomoy you will be missed.